Warning: This post is four A4-pages long! Plans and schedules are made, presentations written and finally the moment comes. I have found that it is always hard to know in advance what the audience will be like... In Jerusalem I talked about preparing PDF files for CAT tools and not everyone there used CAT tools... the blank faces were hard to miss. However, for Poland the same topic (a workshop with Marek Pawelec) could have been prepared at a higher level. Keeping the above in mind when writing a presentation makes you doubt yourself big time! Joy and I were lucky enough to do a trial run in Amsterdam at a translation agency before fine-tuning our presentation. Upon arrival the question our fellow translators mostly asked was how we were going to make sure neither of us would hog the limelight. They were surprised to hear we would do it by going with the flow. I personally suspect they were actually worried that Joy would not be able to stop the flow of words coming out of my mouth, as I am known to talk and talk and talk... What not everyone is aware of is that I actually enjoy listening to others too! Especially if they have something to say. 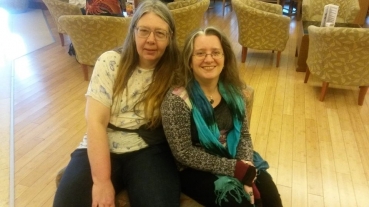 Joy and I enjoyed our presentation and we were happily surprised when a few translators who were not friends came to us after it to say they thoroughly enjoyed our talk. It was the first one I have given with Joy, but it is certainly not the last. The next is already planned for the Proz.com conference in Rotterdam organized by Nigel Saych in June this year! The topic is completely different but we will again try to create a presentation which is not boring, provides information and makes our attendees laugh. Our topic is the impact of short-term and long-term illness on working relationships (mainly communication), another topic Joy and I decided was not addressed as yet. After good wine, finger food and a great atmosphere we all went to our respective beds to sleep while we could. I decided to go to Luca’s talk on learning languages as I have started to teach Dutch and English to CEOs, CFOs and other managers in the last few years as a way to interact with humans directly instead of just through my computer. His presentation was fun and even though he did not actually have the puppy eyes the picture had led me to expect, I thoroughly enjoyed his presentation. He stated that if you do not learn the language you set out to learn, this is due to lack of motivation as motivation drops at first. He had a graph to show the motivation curve. Repetition is key to retaining information, but you have to make it a little different to ensure you stay focussed. The best system is working on learning the language for a certain period of time each day. The length of this period has to be determined by your personal experience on when your focus is gone and you need to do something else. He also stated you just have to make time! At the end of his presentation he slipped up and said he did not have time, which was immediately corrected by someone who had been listening closely! Marek (Buchtel) was going to talk about the cloud but as I prefer the sun and the safety of my server, and Rose is omnipresent on the Internet, I decided to see what Fernanda has to say. It was refreshing to hear someone state that the apps, tools and more she was mentioning were just a list of options, that alternatives are provided daily and a comprehensive list would be outdated on the day of publication. Fernanda mainly wanted to provide options to allow each of us to take what we thought would be useful for us. We all have different work processes and different needs. She did mention Apple options once in a while but even though she had first-hand knowledge on the system, she translates on a Windows OS which also has the broadest range of options. Kevin is a man in his own world. He often posts solutions to issues which are interesting and do not follow an accepted train of thought. I, therefore, had to miss Alessia’s presentation on discovering business talents and increasing my turnover, which I would have attended if I could. I do not work on European Union translations making that a little easier to miss even though I hope someone will post information on that too! Kevin talked about his discovery of a speech recognition tool on his iPhone that transcribes the text perfectly even if you have been dictating under less than perfect conditions, at least for some languages. He then gave the floor to Tiago Neto who, unfortunately, could not show us on the screen what he was doing. Kevin had discussed the dictation software with others and someone had mentioned that the problem was making sure that the software recognized terminology. If I am not mistaken Tiago had provided the solution to this problem: even though you could not load a term base to the software you can upload a list of contacts to your iPhone. If you upload a list of terms instead of actual contacts these would be recognized when dictating. Even though I do not expect to use this for my work, it is good to know that it is possible! It seems that My Echo works on Windows... We will soon hear more about this through a different channel! The networking dinner took place in a wonderful restaurant, Vinodol, where the food was excellent as was the wine, the service and the company. It was great that we could move around from table to table to talk to others when we wanted to. I enjoy finding mistakes in texts and pointing out how to improve anything and everything the next time around, but in this case I have absolutely NOTHING to say, which actually says it all! Amy gave a morning yoga lesson which I heard was wonderful. Joy went but I stayed in our room all alone to recharge my batteries for the crowded day ahead. Konstantin tried to recreate a Proz.com event attended by five thousand translation industry related individuals. The room was not very full and people were not allowed to comment or state only to ask questions to the interviewees. The vendor manager stated her job was to select potential translators after which the project manager decides whom to ask for projects. In my experience this is not the case. The vendor managers of large agencies match translator teams to accounts, after which the project managers take over for the individual projects. The idea was great, but it somehow did not lift off as a live experience. Next, Joy and I were on. I think that what most people took from our talk is that QA is like hugging, it has to be thorough and for the right reasons to actually add value. The final party at a Zagreb night club allowed us to stay in one place for dinner and drinks and the dance party, but the quality of the food and wine was not up to the high standard set the previous night. Sameh regaled us with his voice, we had ample opportunity to dance and Marek clearly won the Silly Dance competition I entered into with him. I do not want to embarrass others by making any further comments on the evening... All I will say is that fun was had! There were two full-day excursions to explore the area on Sunday and Monday which I did not join... I heard these were fantastic! It was a great conference, as expected. It provided new information, new friends and lots of fun. I am looking forward to BP16! This blog reflects my experience of BP15. Please feel free to comment on this blog through my Facebook or LinkedIn profiles (in private or public). I do not monitor our website sufficiently to allow comments here!